This article is about the study of weather. For the science of measurement, see Metrology. For the study of meteors, see Meteoritics. For other uses of the root word "meteor", see Meteor (disambiguation). Meteorology is a branch of the atmospheric sciences which includes atmospheric chemistry and atmospheric physics, with a major focus on weather forecasting. The study of meteorology dates back millennia, though significant progress in meteorology did not occur until the 18th century. The 19th century saw modest progress in the field after weather observation networks were formed across broad regions. Prior attempts at prediction of weather depended on historical data. It was not until after the elucidation of the laws of physics and more particularly, the development of the computer, allowing for the automated solution of a great many equations that model the weather, in the latter half of the 20th century that significant breakthroughs in weather forecasting were achieved. An important domain of weather forecasting is marine weather forecasting as it relates to maritime and coastal safety, in which weather effects also include atmospheric interactions with large bodies of water. Meteorological phenomena are observable weather events that are explained by the science of meteorology. Meteorological phenomena are described and quantified by the variables of Earth's atmosphere: temperature, air pressure, water vapour, mass flow, and the variations and interactions of those variables, and how they change over time. Different spatial scales are used to describe and predict weather on local, regional, and global levels. Meteorology, climatology, atmospheric physics, and atmospheric chemistry are sub-disciplines of the atmospheric sciences. Meteorology and hydrology compose the interdisciplinary field of hydrometeorology. The interactions between Earth's atmosphere and its oceans are part of a coupled ocean-atmosphere system. Meteorology has application in many diverse fields such as the military, energy production, transport, agriculture, and construction. The word meteorology is from the Ancient Greek μετέωρος metéōros (meteor) and -λογία -logia (-(o)logy), meaning "the study of things high in the air". The ability to predict rains and floods based on annual cycles was evidently used by humans at least from the time of agricultural settlement if not earlier. Early approaches to predicting weather were based on astrology and were practiced by priests. Cuneiform inscriptions on Babylonian tablets included associations between thunder and rain. The Chaldeans differentiated the 22° and 46° halos. Ancient Indian Upanishads contain mentions of clouds and seasons. The Samaveda mentions sacrifices to be performed when certain phenomena were noticed. Varāhamihira's classical work Brihatsamhita, written about 500 AD, provides evidence of weather observation. In 350 BC, Aristotle wrote Meteorology. Aristotle is considered the founder of meteorology. One of the most impressive achievements described in the Meteorology is the description of what is now known as the hydrologic cycle. If the flashing body is set on fire and rushes violently to the Earth it is called a thunderbolt; if it is only half of fire, but violent also and massive, it is called a meteor; if it is entirely free from fire, it is called a smoking bolt. They are all called 'swooping bolts' because they swoop down upon the Earth. Lightning is sometimes smoky, and is then called 'smoldering lightning"; sometimes it darts quickly along, and is then said to be vivid. At other times, it travels in crooked lines, and is called forked lightning. When it swoops down upon some object it is called 'swooping lightning'. Early attempts at predicting weather were often related to prophecy and divining, and were sometimes based on astrological ideas. Admiral FitzRoy tried to separate scientific approaches from prophetic ones. Ptolemy wrote on the atmospheric refraction of light in the context of astronomical observations. In 1021, Alhazen showed that atmospheric refraction is also responsible for twilight; he estimated that twilight begins when the sun is 19 degrees below the horizon, and also used a geometric determination based on this to estimate the maximum possible height of the Earth's atmosphere as 52,000 passim (about 49 miles, or 79 km). St. Albert the Great was the first to propose that each drop of falling rain had the form of a small sphere, and that this form meant that the rainbow was produced by light interacting with each raindrop. Roger Bacon was the first to calculate the angular size of the rainbow. He stated that a rainbow summit can not appear higher than 42 degrees above the horizon. In the late 13th century and early 14th century, Kamāl al-Dīn al-Fārisī and Theodoric of Freiberg were the first to give the correct explanations for the primary rainbow phenomenon. Theoderic went further and also explained the secondary rainbow. In 1716, Edmund Halley suggested that aurorae are caused by "magnetic effluvia" moving along the Earth's magnetic field lines. In 1441, King Sejong's son, Prince Munjong of Korea, invented the first standardized rain gauge. These were sent throughout the Joseon dynasty of Korea as an official tool to assess land taxes based upon a farmer's potential harvest. 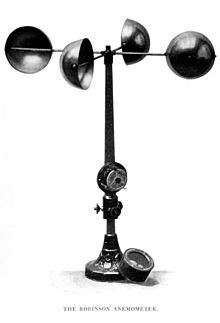 In 1450, Leone Battista Alberti developed a swinging-plate anemometer, and was known as the first anemometer. In 1607, Galileo Galilei constructed a thermoscope. In 1611, Johannes Kepler wrote the first scientific treatise on snow crystals: "Strena Seu de Nive Sexangula (A New Year's Gift of Hexagonal Snow)". In 1643, Evangelista Torricelli invented the mercury barometer. In 1662, Sir Christopher Wren invented the mechanical, self-emptying, tipping bucket rain gauge. In 1714, Gabriel Fahrenheit created a reliable scale for measuring temperature with a mercury-type thermometer. In 1742, Anders Celsius, a Swedish astronomer, proposed the "centigrade" temperature scale, the predecessor of the current Celsius scale. In 1783, the first hair hygrometer was demonstrated by Horace-Bénédict de Saussure. In 1802–1803, Luke Howard wrote On the Modification of Clouds, in which he assigns cloud types Latin names. In 1806, Francis Beaufort introduced his system for classifying wind speeds. Near the end of the 19th century the first cloud atlases were published, including the International Cloud Atlas, which has remained in print ever since. The April 1960 launch of the first successful weather satellite, TIROS-1, marked the beginning of the age where weather information became available globally. In 1648, Blaise Pascal rediscovered that atmospheric pressure decreases with height, and deduced that there is a vacuum above the atmosphere. In 1738, Daniel Bernoulli published Hydrodynamics, initiating the Kinetic theory of gases and established the basic laws for the theory of gases. In 1761, Joseph Black discovered that ice absorbs heat without changing its temperature when melting. In 1772, Black's student Daniel Rutherford discovered nitrogen, which he called phlogisticated air, and together they developed the phlogiston theory. In 1777, Antoine Lavoisier discovered oxygen and developed an explanation for combustion. In 1783, in Lavoisier's essay "Reflexions sur le phlogistique", he deprecates the phlogiston theory and proposes a caloric theory. In 1804, Sir John Leslie observed that a matte black surface radiates heat more effectively than a polished surface, suggesting the importance of black-body radiation. In 1808, John Dalton defended caloric theory in A New System of Chemistry and described how it combines with matter, especially gases; he proposed that the heat capacity of gases varies inversely with atomic weight. In 1824, Sadi Carnot analyzed the efficiency of steam engines using caloric theory; he developed the notion of a reversible process and, in postulating that no such thing exists in nature, laid the foundation for the second law of thermodynamics. 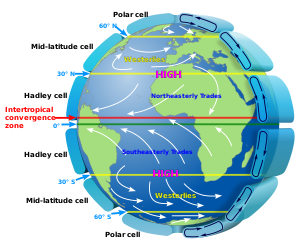 General circulation of the Earth's atmosphere: The westerlies and trade winds are part of the Earth's atmospheric circulation. In 1494, Christopher Columbus experienced a tropical cyclone, which led to the first written European account of a hurricane. In 1686, Edmund Halley presented a systematic study of the trade winds and monsoons and identified solar heating as the cause of atmospheric motions. In 1735, an ideal explanation of global circulation through study of the trade winds was written by George Hadley. In 1743, when Benjamin Franklin was prevented from seeing a lunar eclipse by a hurricane, he decided that cyclones move in a contrary manner to the winds at their periphery. Understanding the kinematics of how exactly the rotation of the Earth affects airflow was partial at first. Gaspard-Gustave Coriolis published a paper in 1835 on the energy yield of machines with rotating parts, such as waterwheels. In 1856, William Ferrel proposed the existence of a circulation cell in the mid-latitudes, and the air within deflected by the Coriolis force resulting in the prevailing westerly winds. Late in the 19th century, the motion of air masses along isobars was understood to be the result of the large-scale interaction of the pressure gradient force and the deflecting force. By 1912, this deflecting force was named the Coriolis effect. Just after World War I, a group of meteorologists in Norway led by Vilhelm Bjerknes developed the Norwegian cyclone model that explains the generation, intensification and ultimate decay (the life cycle) of mid-latitude cyclones, and introduced the idea of fronts, that is, sharply defined boundaries between air masses. The group included Carl-Gustaf Rossby (who was the first to explain the large scale atmospheric flow in terms of fluid dynamics), Tor Bergeron (who first determined how rain forms) and Jacob Bjerknes. This "Hyetographic or Rain Map of the World " was first published 1848 by Alexander Keith Johnston. 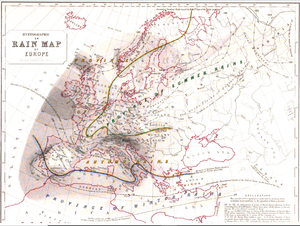 This "Hyetographic or Rain Map of Europe" was also published in 1848 as part of "The Physical Atlas". In the late 16th century and first half of the 17th century a range of meteorological instruments was invented – the thermometer, barometer, hydrometer, as well as wind and rain gauges. In the 1650s natural philosophers started using these instruments to systematically record weather observations. Scientific academies established weather diaries and organised observational networks. In 1654, Ferdinando II de Medici established the first weather observing network, that consisted of meteorological stations in Florence, Cutigliano, Vallombrosa, Bologna, Parma, Milan, Innsbruck, Osnabrück, Paris and Warsaw. The collected data were sent to Florence at regular time intervals. In the 1660s Robert Hooke of the Royal Society of London sponsored networks of weather observers. Hippocrates' treatise Airs, Waters, and Places had linked weather to disease. Thus early meteorologists attempted to correlate weather patterns with epidemic outbreaks, and the climate with public health. During the Age of Enlightenment meteorology tried to rationalise traditional weather lore, including astrological meteorology. But there were also attempts to establish a theoretical understanding of weather phenomena. Edmond Halley and George Hadley tried to explain trade winds. They reasoned that the rising mass of heated equator air is replaced by an inflow of cooler air from high latitudes. A flow of warm air at high altitude from equator to poles in turn established an early picture of circulation. Frustration with the lack of discipline among weather observers, and the poor quality of the instruments, led the early modern nation states to organise large observation networks. Thus by the end of the 18th century meteorologists had access to large quantities of reliable weather data. In 1832, an electromagnetic telegraph was created by Baron Schilling. The arrival of the electrical telegraph in 1837 afforded, for the first time, a practical method for quickly gathering surface weather observations from a wide area. This data could be used to produce maps of the state of the atmosphere for a region near the Earth's surface and to study how these states evolved through time. To make frequent weather forecasts based on these data required a reliable network of observations, but it was not until 1849 that the Smithsonian Institution began to establish an observation network across the United States under the leadership of Joseph Henry. Similar observation networks were established in Europe at this time. The Reverend William Clement Ley was key in understanding of cirrus clouds and early understandings of Jet Streams. Charles Kenneth Mackinnon Douglas, known as 'CKM' Douglas read Ley's papers after his death and carried on the early study of weather systems. Nineteenth century researchers in meteorology were drawn from military or medical backgrounds, rather than trained as dedicated scientists. In 1854, the United Kingdom government appointed Robert FitzRoy to the new office of Meteorological Statist to the Board of Trade with the task of gathering weather observations at sea. FitzRoy's office became the United Kingdom Meteorological Office in 1854, the second oldest national meteorological service in the world (the Central Institution for Meteorology and Geodynamics (ZAMG) in Austria was founded in 1851 and is the oldest weather service in the world). The first daily weather forecasts made by FitzRoy's Office were published in The Times newspaper in 1860. The following year a system was introduced of hoisting storm warning cones at principal ports when a gale was expected. Over the next 50 years many countries established national meteorological services. The India Meteorological Department (1875) was established to follow tropical cyclone and monsoon. The Finnish Meteorological Central Office (1881) was formed from part of Magnetic Observatory of Helsinki University. Japan's Tokyo Meteorological Observatory, the forerunner of the Japan Meteorological Agency, began constructing surface weather maps in 1883. The United States Weather Bureau (1890) was established under the United States Department of Agriculture. The Australian Bureau of Meteorology (1906) was established by a Meteorology Act to unify existing state meteorological services. In 1904, Norwegian scientist Vilhelm Bjerknes first argued in his paper Weather Forecasting as a Problem in Mechanics and Physics that it should be possible to forecast weather from calculations based upon natural laws. It was not until later in the 20th century that advances in the understanding of atmospheric physics led to the foundation of modern numerical weather prediction. In 1922, Lewis Fry Richardson published "Weather Prediction By Numerical Process", after finding notes and derivations he worked on as an ambulance driver in World War I. He described how small terms in the prognostic fluid dynamics equations that govern atmospheric flow could be neglected, and a numerical calculation scheme that could be devised to allow predictions. Richardson envisioned a large auditorium of thousands of people performing the calculations. However, the sheer number of calculations required was too large to complete without electronic computers, and the size of the grid and time steps used in the calculations led to unrealistic results. Though numerical analysis later found that this was due to numerical instability. 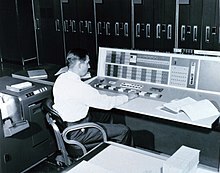 Starting in the 1950s, numerical forecasts with computers became feasible. The first weather forecasts derived this way used barotropic (single-vertical-level) models, and could successfully predict the large-scale movement of midlatitude Rossby waves, that is, the pattern of atmospheric lows and highs. In 1959, the UK Meteorological Office received its first computer, a Ferranti Mercury. In the 1960s, the chaotic nature of the atmosphere was first observed and mathematically described by Edward Lorenz, founding the field of chaos theory. These advances have led to the current use of ensemble forecasting in most major forecasting centers, to take into account uncertainty arising from the chaotic nature of the atmosphere. Mathematical models used to predict the long term weather of the Earth (climate models), have been developed that have a resolution today that are as coarse as the older weather prediction models. These climate models are used to investigate long-term climate shifts, such as what effects might be caused by human emission of greenhouse gases. Meteorologists are scientists who study meteorology. The American Meteorological Society published and continually updates an authoritative electronic Meteorology Glossary. Meteorologists work in government agencies, private consulting and research services, industrial enterprises, utilities, radio and television stations, and in education. 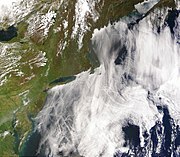 In the United States, meteorologists held about 9,400 jobs in 2009. Meteorologists are best known by the public for weather forecasting. Some radio and television weather forecasters are professional meteorologists, while others are reporters (weather specialist, weatherman, etc.) with no formal meteorological training. The American Meteorological Society and National Weather Association issue "Seals of Approval" to weather broadcasters who meet certain requirements. Each science has its own unique sets of laboratory equipment. In the atmosphere, there are many things or qualities of the atmosphere that can be measured. Rain, which can be observed, or seen anywhere and anytime was one of the first atmospheric qualities measured historically. Also, two other accurately measured qualities are wind and humidity. Neither of these can be seen but can be felt. The devices to measure these three sprang up in the mid-15th century and were respectively the rain gauge, the anemometer, and the hygrometer. Many attempts had been made prior to the 15th century to construct adequate equipment to measure the many atmospheric variables. Many were faulty in some way or were simply not reliable. Even Aristotle noted this in some of his work as the difficulty to measure the air. Sets of surface measurements are important data to meteorologists. They give a snapshot of a variety of weather conditions at one single location and are usually at a weather station, a ship or a weather buoy. The measurements taken at a weather station can include any number of atmospheric observables. Usually, temperature, pressure, wind measurements, and humidity are the variables that are measured by a thermometer, barometer, anemometer, and hygrometer, respectively. Professional stations may also include air quality sensors (carbon monoxide, carbon dioxide, methane, ozone, dust, and smoke), ceilometer (cloud ceiling), falling precipitation sensor, flood sensor, lightning sensor, microphone (explosions, sonic booms, thunder), pyranometer/pyrheliometer/spectroradiometer (IR/Vis/UV photodiodes), rain gauge/snow gauge, scintillation counter (background radiation, fallout, radon), seismometer (earthquakes and tremors), transmissometer (visibility), and a GPS clock for data logging. Upper air data are of crucial importance for weather forecasting. The most widely used technique is launches of radiosondes. Supplementing the radiosondes a network of aircraft collection is organized by the World Meteorological Organization. Remote sensing, as used in meteorology, is the concept of collecting data from remote weather events and subsequently producing weather information. The common types of remote sensing are Radar, Lidar, and satellites (or photogrammetry). Each collects data about the atmosphere from a remote location and, usually, stores the data where the instrument is located. Radar and Lidar are not passive because both use EM radiation to illuminate a specific portion of the atmosphere. Weather satellites along with more general-purpose Earth-observing satellites circling the earth at various altitudes have become an indispensable tool for studying a wide range of phenomena from forest fires to El Niño. The study of the atmosphere can be divided into distinct areas that depend on both time and spatial scales. At one extreme of this scale is climatology. In the timescales of hours to days, meteorology separates into micro-, meso-, and synoptic scale meteorology. Respectively, the geospatial size of each of these three scales relates directly with the appropriate timescale. Other subclassifications are used to describe the unique, local, or broad effects within those subclasses. Microscale meteorology is the study of atmospheric phenomena on a scale of about 1 kilometre (0.62 mi) or less. Individual thunderstorms, clouds, and local turbulence caused by buildings and other obstacles (such as individual hills) are modeled on this scale. Mesoscale meteorology is the study of atmospheric phenomena that has horizontal scales ranging from 1 km to 1000 km and a vertical scale that starts at the Earth's surface and includes the atmospheric boundary layer, troposphere, tropopause, and the lower section of the stratosphere. Mesoscale timescales last from less than a day to weeks. The events typically of interest are thunderstorms, squall lines, fronts, precipitation bands in tropical and extratropical cyclones, and topographically generated weather systems such as mountain waves and sea and land breezes. NOAA: Synoptic scale weather analysis. Synoptic scale meteorology predicts atmospheric changes at scales up to 1000 km and 105 sec (28 days), in time and space. At the synoptic scale, the Coriolis acceleration acting on moving air masses (outside of the tropics) plays a dominant role in predictions. The phenomena typically described by synoptic meteorology include events such as extratropical cyclones, baroclinic troughs and ridges, frontal zones, and to some extent jet streams. All of these are typically given on weather maps for a specific time. The minimum horizontal scale of synoptic phenomena is limited to the spacing between surface observation stations. 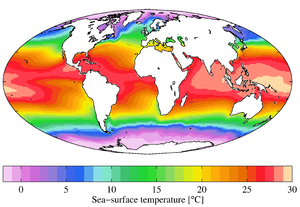 Annual mean sea surface temperatures. Global scale meteorology is the study of weather patterns related to the transport of heat from the tropics to the poles. Very large scale oscillations are of importance at this scale. These oscillations have time periods typically on the order of months, such as the Madden–Julian oscillation, or years, such as the El Niño–Southern Oscillation and the Pacific decadal oscillation. Global scale meteorology pushes into the range of climatology. The traditional definition of climate is pushed into larger timescales and with the understanding of the longer time scale global oscillations, their effect on climate and weather disturbances can be included in the synoptic and mesoscale timescales predictions. Numerical Weather Prediction is a main focus in understanding air–sea interaction, tropical meteorology, atmospheric predictability, and tropospheric/stratospheric processes. The Naval Research Laboratory in Monterey, California, developed a global atmospheric model called Navy Operational Global Atmospheric Prediction System (NOGAPS). NOGAPS is run operationally at Fleet Numerical Meteorology and Oceanography Center for the United States Military. Many other global atmospheric models are run by national meteorological agencies. Boundary layer meteorology is the study of processes in the air layer directly above Earth's surface, known as the atmospheric boundary layer (ABL). The effects of the surface – heating, cooling, and friction – cause turbulent mixing within the air layer. Significant movement of heat, matter, or momentum on time scales of less than a day are caused by turbulent motions. Boundary layer meteorology includes the study of all types of surface–atmosphere boundary, including ocean, lake, urban land and non-urban land for the study of meteorology. Dynamic meteorology generally focuses on the fluid dynamics of the atmosphere. The idea of air parcel is used to define the smallest element of the atmosphere, while ignoring the discrete molecular and chemical nature of the atmosphere. An air parcel is defined as a point in the fluid continuum of the atmosphere. The fundamental laws of fluid dynamics, thermodynamics, and motion are used to study the atmosphere. The physical quantities that characterize the state of the atmosphere are temperature, density, pressure, etc. These variables have unique values in the continuum. Weather forecasting is the application of science and technology to predict the state of the atmosphere at a future time and given location. Humans have attempted to predict the weather informally for millennia and formally since at least the 19th century. Weather forecasts are made by collecting quantitative data about the current state of the atmosphere and using scientific understanding of atmospheric processes to project how the atmosphere will evolve. Once an all-human endeavor based mainly upon changes in barometric pressure, current weather conditions, and sky condition, forecast models are now used to determine future conditions. Human input is still required to pick the best possible forecast model to base the forecast upon, which involves pattern recognition skills, teleconnections, knowledge of model performance, and knowledge of model biases. The chaotic nature of the atmosphere, the massive computational power required to solve the equations that describe the atmosphere, error involved in measuring the initial conditions, and an incomplete understanding of atmospheric processes mean that forecasts become less accurate as the difference in current time and the time for which the forecast is being made (the range of the forecast) increases. The use of ensembles and model consensus help narrow the error and pick the most likely outcome. There are a variety of end uses to weather forecasts. Weather warnings are important forecasts because they are used to protect life and property. Forecasts based on temperature and precipitation are important to agriculture, and therefore to commodity traders within stock markets. Temperature forecasts are used by utility companies to estimate demand over coming days. On an everyday basis, people use weather forecasts to determine what to wear. Since outdoor activities are severely curtailed by heavy rain, snow, and wind chill, forecasts can be used to plan activities around these events, and to plan ahead and survive them. The effects of ice on aircraft are cumulative—thrust is reduced, drag increases, lift lessens, and weight increases. The results are an increase in stall speed and a deterioration of aircraft performance. In extreme cases, 2 to 3 inches of ice can form on the leading edge of the airfoil in less than 5 minutes. It takes but 1/2 inch of ice to reduce the lifting power of some aircraft by 50 percent and increases the frictional drag by an equal percentage. Meteorologists, soil scientists, agricultural hydrologists, and agronomists are people concerned with studying the effects of weather and climate on plant distribution, crop yield, water-use efficiency, phenology of plant and animal development, and the energy balance of managed and natural ecosystems. Conversely, they are interested in the role of vegetation on climate and weather. Hydrometeorology is the branch of meteorology that deals with the hydrologic cycle, the water budget, and the rainfall statistics of storms. A hydrometeorologist prepares and issues forecasts of accumulating (quantitative) precipitation, heavy rain, heavy snow, and highlights areas with the potential for flash flooding. Typically the range of knowledge that is required overlaps with climatology, mesoscale and synoptic meteorology, and other geosciences. The multidisciplinary nature of the branch can result in technical challenges, since tools and solutions from each of the individual disciplines involved may behave slightly differently, be optimized for different hard- and software platforms and use different data formats. There are some initiatives – such as the DRIHM project – that are trying to address this issue. Nuclear meteorology investigates the distribution of radioactive aerosols and gases in the atmosphere. Maritime meteorology deals with air and wave forecasts for ships operating at sea. Organizations such as the Ocean Prediction Center, Honolulu National Weather Service forecast office, United Kingdom Met Office, and JMA prepare high seas forecasts for the world's oceans. Military meteorology is the research and application of meteorology for military purposes. In the United States, the United States Navy's Commander, Naval Meteorology and Oceanography Command oversees meteorological efforts for the Navy and Marine Corps while the United States Air Force's Air Force Weather Agency is responsible for the Air Force and Army. Environmental meteorology mainly analyzes industrial pollution dispersion physically and chemically based on meteorological parameters such as temperature, humidity, wind, and various weather conditions. Meteorology applications in renewable energy includes basic research, "exploration", and potential mapping of wind power and solar radiation for wind and solar energy. ^ a b Hellmann, G. (1908-10-01). "The dawn of meteorology". Quarterly Journal of the Royal Meteorological Society. 34 (148): 221–232. Bibcode:1908QJRMS..34..221H. doi:10.1002/qj.49703414802. ISSN 1477-870X. ^ a b NS, nsimd@ymail.com. "History of Meteorology in India". Imd.gov.in. Archived from the original on 2012-03-30. Retrieved 2012-03-25. ^ "meteorology: Introduction". Retrieved 16 June 2015. ^ "94.05.01: Meteorology". Retrieved 16 June 2015. ^ "Weather". Retrieved 16 June 2015. ^ Fahd, Toufic. "Botany and agriculture": 815. ^ Morelon, Régis; Rashed, Roshdi (1996). Encyclopedia of the History of Arabic Science. 3. Routledge. ISBN 978-0-415-12410-2. ^ Anderson, Katharine (1999). "The weather prophets: science and reputation in Victorian meteorology". History of Science. 37 (2): 179–215. Bibcode:1999HisSc..37..179A. doi:10.1177/007327539903700203. ^ Smith AM, 1996. "Ptolemy's Theory of Visual Perception: An English Translation of the Optics", pp. 46. Transactions of the American Philosophical Society vol. 86, part 2. ^ Frisinger H (1973), "Aristotle's Legacy in Meteorology." Bulletin of the American Meteorological Society volume 3 issue 3, pp. 198–204. Link. ^ "Ancient and pre-Renaissance Contributors to Meteorology". Retrieved 16 June 2015. ^ Raymond L. Lee; Alistair B. Fraser (2001). The Rainbow Bridge: Rainbows in Art, Myth, and Science. Penn State Press. p. 155. ISBN 978-0-271-01977-2. ^ Earth Science' 2005 Ed. Rex Bookstore, Inc. p. 151. ISBN 978-971-23-3938-7. ^ a b Jacobson, Mark Z. (June 2005). Fundamentals of Atmospheric Modeling (paperback) (2nd ed.). New York: Cambridge University Press. p. 828. ISBN 978-0-521-54865-6. ^ "Early Snow Crystal Observations". Retrieved 16 June 2015. ^ Grigull, U., Fahrenheit, a Pioneer of Exact Thermometry. Heat Transfer, 1966, The Proceedings of the 8th International Heat Transfer Conference, San Francisco, 1966, Vol. 1. ^ Thornes, John. E. (1999). John Constable's Skies. The University of Birmingham Press, pp. 189. ISBN 1-902459-02-4. ^ Bill Giles O.B.E. (2009). Beaufort Scale BBC. Retrieved on 2009-05-12. ^ Florin to Pascal, September 1647, Œuves completes de Pascal, 2:682. ^ O'Connor, John J.; Robertson, Edmund F., "Meteorology", MacTutor History of Mathematics archive, University of St Andrews . ^ Biographical note at "Lectures and Papers of Professor Daniel Rutherford (1749–1819), and Diary of Mrs Harriet Rutherford". ^ "Sur la combustion en général" ("On Combustion in general", 1777) and "Considérations Générales sur la Nature des Acides" ("General Considerations on the Nature of Acids", 1778). ^ Nicholas W. Best, "Lavoisier's 'Reflections on Phlogiston' I: Against Phlogiston Theory", Foundations of Chemistry, 2015, 17, 137–151. ^ Nicholas W. Best, Lavoisier's 'Reflections on Phlogiston' II: On the Nature of Heat, Foundations of Chemistry, 2015, 17. In this early work, Lavoisier calls it "igneous fluid". ^ The 1880 edition of A Guide to the Scientific Knowledge of Things Familiar, a 19th-century educational science book, explained heat transfer in terms of the flow of caloric. ^ Morison, Samuel Eliot, Admiral of the Ocean Sea: A Life of Cristopher Columbus, Boston, 1942, page 617. ^ George Hadley, "Concerning the cause of the general trade winds", Philosophical Transactions, vol. 39 (1735). ^ Dorst, Neal, FAQ:_Hurricanes,_Typhoons,_and_Tropical_Cyclones:_Hurricane_Timeline, Hurricane_Research_Division,_Atlantic_Oceanographic_and_Meteorological_Laboratory,_NOAA, January 2006. ^ G-G Coriolis (1835). "Sur les équations du mouvement relatif des systèmes de corps". J. De l'Ecole Royale Polytechnique. 15: 144–154. ^ William Ferrel. An Essay on the Winds and the Currents of the Ocean. Archived 2013-10-11 at the Wayback Machine Retrieved on 2009-01-01. ^ Arthur Gordon Webster (1912). The Dynamics of Particles and of Rigid, Elastic, and Fluid Bodies. B.G. Teubner. p. 320. ^ Shaye Johnson. The Norwegian Cyclone Model. Archived 2006-09-01 at the Wayback Machine Retrieved on 2006-10-11. ^ a b c John L. Heilbron (2003). The Oxford Companion to the History of Modern Science. Oxford University Press. p. 518. ISBN 9780199743766. ^ "Smithsonian Institution Archives". Archived from the original on 20 October 2006. Retrieved 16 June 2015. ^ "Prophet without Honour: The Reverend William Clement Ley and the hunt for the jet stream". rmets.org. Archived from the original on 2016-08-28. Retrieved 13 October 2016. ^ Field, M. (1 October 1999). "Meteorologist's profile — Charles Kenneth Mackinnon Douglas, OBE, AFC, MA". Weather. 54 (10): 321–327. Bibcode:1999Wthr...54..321F. doi:10.1002/j.1477-8696.1999.tb03992.x. ^ Williamson, Fiona (2015-09-01). "Weathering the empire: meteorological research in the early British straits settlements". The British Journal for the History of Science. 48 (3): 475–492. doi:10.1017/S000708741500028X. ISSN 1474-001X. PMID 26234178. ^ India Meteorological Department Establishment of IMD. Archived 2015-11-20 at the Wayback Machine Retrieved on 2009-01-01. ^ Finnish Meteorological Institute. History of Finnish Meteorological Institute. Archived 2010-07-25 at the Wayback Machine Retrieved on 2009-01-01. ^ Japan Meteorological Agency. History. Archived 2010-12-25 at the Wayback Machine Retrieved on 2006-10-22. ^ "BOM celebrates 100 years". Australian Broadcasting Corporation. 2007-12-31. ^ "Collections in Perth: 20. Meteorology". National Archives of Australia. Retrieved 2008-05-24. ^ Berknes, V. (1904) "Das Problem der Wettervorhersage, betrachtet vom Standpunkte der Mechanik und der Physik" (The problem of weather prediction, considered from the viewpoints of mechanics and physics), Meteorologische Zeitschrift, 21 : 1–7. Available in English on-line at: Schweizerbart science publishers. ^ "Pioneers in Modern Meteorology and Climatology: Vilhelm and Jacob Bjerknes" (PDF). Retrieved 2008-10-13. ^ Richardson, Lewis Fry, Weather Prediction by Numerical Process (Cambridge, England: Cambridge University Press, 1922). Available on-line at: Internet Archive.org. ^ American Institute of Physics. Atmospheric General Circulation Modeling. Archived 2008-03-25 at the Wayback Machine Retrieved on 2008-01-13. ^ Cox, John D. (2002). Storm Watchers. John Wiley & Sons, Inc. p. 208. ISBN 978-0-471-38108-2. ^ "The history of Numerical Weather Prediction at the Met Office". Met Office. ^ Edward N. Lorenz, "Deterministic non-periodic flow", Journal of the Atmospheric Sciences, vol. 20, pages 130–141 (1963). ^ Manousos, Peter (2006-07-19). "Ensemble Prediction Systems". Hydrometeorological Prediction Center. Retrieved 2010-12-31. ^ Glickman, Todd S. (June 2009). Meteorology Glossary (electronic) (2nd ed.). Cambridge, Massachusetts: American Meteorological Society. Retrieved March 10, 2014. ^ Glickman, Todd S. (June 2000). Meteorology Glossary (electronic) (2nd ed.). Cambridge, Massachusetts: American Meteorological Society. Retrieved March 10, 2014. ^ Bureau of labor statistics: "Occupational Outlook Handbook, 2010–11 Edition"
^ Office of the Federal Coordinator of Meteorology. Federal Meteorological Handbook No. 1 - Surface Weather Observations and Reports: September 2005. Archived 1999-04-20 at the Wayback Machine Retrieved on 2009-01-02. ^ Peebles, Peyton, , Radar Principles, John Wiley & Sons, Inc., New York, ISBN 0-471-25205-0. ^ Holton, James. "An Introduction to Dynamic Meteorology" (PDF). Elsevier Academic Press. p. 5. Retrieved 5 March 2016. ^ "AMS Glossary of Meteorology". American Meteorological Society. Archived from the original on 2011-06-06. Retrieved 2008-04-12. ^ Online Glossary of Meteorology, American Meteorological Society , 2nd Ed., 2000, Allen Press. ^ Global Modelling, US Naval Research Laboratory, Monterey, Ca. ^ Garratt, J.R., The atmospheric boundary layer, Cambridge University Press, 1992; ISBN 0-521-38052-9. ^ Holton, J.R. . An Introduction to Dynamic Meteorology, 4th Ed., Burlington, Md: Elsevier Inc.. ISBN 0-12-354015-1. ^ Klaus Weickmann, Jeff Whitaker, Andres Roubicek and Catherine Smith. The Use of Ensemble Forecasts to Produce Improved Medium Range (3–15 days) Weather Forecasts. Retrieved on 2007-02-16. ^ Todd Kimberlain. Tropical cyclone motion and intensity talk (June 2007). Retrieved on 2007-07-21. ^ Richard J. Pasch, Mike Fiorino, and Chris Landsea. TPC/NHC’S REVIEW OF THE NCEP PRODUCTION SUITE FOR 2006. [permanent dead link] Retrieved on 2008-05-05. ^ An international version called the Aeronautical Information Publication contains parallel information, as well as specific information on the international airports for use by the international community. ^ Agricultural and Forest Meteorology, Elsevier, ISSN 0168-1923. ^ About the HPC, NOAA/ National Weather Service, National Centers for Environmental Prediction, Hydrometeorological Prediction Center, Camp Springs, Maryland, 2007. ^ Super User. "Home". Retrieved 16 June 2015. ^ DRIHM News, number 1, March 2012, p2 "An ideal environment for hydro-meteorology research at the European level"
^ Tsitskishvili, M. S.; Trusov, A. G. (February 1974). "Modern research in nuclear meteorology". Atomic Energy. 36 (2): 197–198. doi:10.1007/BF01117823. Byers, Horace. General Meteorology. New York: McGraw-Hill, 1994. Garret, J.R. (1992) . The atmospheric boundary layer. Cambridge University Press. ISBN 978-0-521-38052-2. Bluestein, H (1992) . Synoptic-Dynamic Meteorology in Midlatitudes: Principles of Kinematics and Dynamics, Vol. 1. Oxford University Press. ISBN 978-0-19-506267-0. Bluestein, H (1993) . Synoptic-Dynamic Meteorology in Midlatitudes: Volume II: Observations and Theory of Weather Systems. Oxford University Press. ISBN 978-0-19-506268-7. Reynolds, R (2005) . Guide to Weather. Buffalo, New York: Firefly Books Inc. p. 208. ISBN 978-1-55407-110-4. Holton, J.R. (2004) . An Introduction to Dynamic Meteorology (4th ed.). Burlington, Md: Elsevier Inc. ISBN 978-0-12-354015-7. Archived from the original on 2013-07-19. Retrieved 2017-05-21. Roulstone, Ian & Norbury, John (2013). Invisible in the Storm: the role of mathematics in understanding weather. Princeton University Press. ISBN 978-0691152721. Glickman, Todd S. (June 2000). Meteorology Glossary (electronic) (2nd ed.). Cambridge, Massachusetts: American Meteorological Society. Gustavo Herrera, Roberto; García-Herrera, Ricardo; Prieto, Luis; Gallego, David; Hernández, Emiliano; Gimeno, Luis; Können, Gunther; Koek, Frits; Wheeler, Dennis; Wilkinson, Clive; Del Rosario Prieto, Maria; Báez, Carlos; Woodruff, Scott. A Dictionary of Nautical Meteorological Terms: CLIWOC Multilingual Dictionary of Meteorological Terms; An English/Spanish/French/Dutch Dictionary of Windforce Terms Used by Mariners from 1750 to 1850 (PDF). CLIWOC. "Meteorology Encyclopedia". Central Weather Bureau. 2018-12-06. Wikimedia Commons has media related to Meteorology. Please see weather forecasting for weather forecast sites. Air Quality Meteorology – Online course that introduces the basic concepts of meteorology and air quality necessary to understand meteorological computer models. Written at a bachelor's degree level. The GLOBE Program – (Global Learning and Observations to Benefit the Environment) An international environmental science and education program that links students, teachers, and the scientific research community in an effort to learn more about the environment through student data collection and observation. Glossary of Meteorology – From the American Meteorological Society, an excellent reference of nomenclature, equations, and concepts for the more advanced reader. This page was last edited on 22 March 2019, at 20:22 (UTC).